This week's roundup includes an interesting interview with a professional mountain bike rider who races on an e-bike. Back in April at Sea Otter Classic, I was introduced to a pro racer who is not like any other I’ve met before. Xavier Marovelli races all summer on trails throughout Europe, and he does it on an electric-assist mountain bike. That’s right, an e-bike. I thought it would be interesting to learn more about the big e-bike scene in Europe, how he trains for these races, and hear his perspective on e-bikes in general. This interview was conducted in French with help from his translator Brian Gilmore. VeloNews: How did you become a professional e-bike racer? I didn’t even know that was possible. Xavier Marovelli: I was racing for two years with KTM in enduro. So, Hai Bike France was developing a new e-bike enduro team and approached me if I wanted to be a part of it. It had been 10 years that I was racing and I was looking for a new challenge in my life because it had always been the same thing, always, always the same thing. So it was a new opportunity, a new challenge. This is my third year with Haibike. 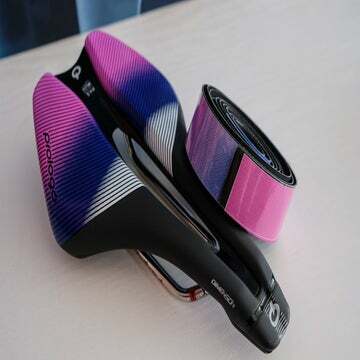 VN: Do you ride only e-bikes, or do you also ride normal bikes for training? XM: I do train one day a week on the road to keep my power. With e-bikes you lose a little bit of your power. Your heart rate, your souplesse is there, but the way you sort of manage the power of the motor means you lose a little bit of your top-end power because you back off a little bit here or there to manage the system’s performance. So you lose a bit of the edge. VN: If you do a long day of e-bike riding, do you have to change batteries? XM: Yes. I live in downtown Nice, and my favorite riding is in the mountains above town, so I ride up into the mountains above Nice, do a little loop, drop back down into Nice, have lunch with my father at noon, charge the bike, and then go out for more. I can do a 100-kilometer day that way. VN: How many races for e-bikes are there in France or Europe? XM: Every race virtually has an e-bike category — every mountain bike race has one. The biggest races are Mega-Avalanche and the French Cup. Even in my department there’s a series that has 11 days of racing. There are a lot of very good riders who ride e-bikes in the winter. Current and former professionals like Nicolas Vouilloz, Fabien Barel who live in Nice and ride these local races on e-bikes to train. You have a level of competition that’s higher than you’d guess in these local races. If you win one of the local races, you’re pretty much the world champion with the talent that is there (laughs). VN: Is there prize money for these e-bike races? XM: Yes, in French Cup and Mega Avalanche there are prizes, it’s a mix of cash prizes and other prizes like a trip to the Reunion Islands. VN: Do your sponsors pay you a salary? XM: No, but they cover my equipment, travel expenses, and everything else. VN: How many riders like you have this sort of sponsorship for e-bike? XM: Probably 10-15. You have riders like me but also some professional riders like Julien Absalon that have separate sponsors with e-bikes. Christophe Sauser does the Transvésubienne [a marathon-style e-bike race]. I’ve been there three years, and I’m hoping this year I can finally take him down! VN: How do they make sure everyone’s bike is the same power at these races? XM: Yes, there are controls at the very big races. People will go around with a diagnostic tool to see the settings of the motor, check the firmware. At small races there aren’t controls. But the courses are such, they’re very much up and down, you can see right away if something is amiss. If a guy is pulling away from you on a climb, you know there’s been some tuning. I haven’t seen any instances of anything nefarious. All the bikes are limited at 25kph. VN: Perhaps you’ve seen that attitudes toward e-bikes are different in the U.S. than they are in Europe. Some people don’t think they should be on mountain bike trails. How do you convince someone that e-bikes should be accepted? XM: Demo events get people on the bikes and show them that it’s not that different than standard cycling. The racing helps bring credibility. Some people say it’s not a sport, but I say go try it and see. The racing helps bring credibility to show that this is a sport. I’m actually putting out just as much effort in a race as you are. I have some friends back in Nice that have never been up to the mountain behind their house, and they were never able to get up there, but with an e-bike they’re able to experience their community in a new way. People who aren’t athletic, it gives them an opportunity to access it and discover. That’s the trouble with trails here that aren’t open to e-bikes. It’s too bad. They aren’t motos. Really, what we want is folks to get out there and discover. It’s about opening doors. Racing is great, but it’s really the pure pleasure of being able to ride with friends and family and getting out to explore the outdoors. VN: Are there any trails you feel that e-bikes should not be allowed on? XM: No, but it’s different in France. There are so many trails. The trails in the area are from centuries ago; they were footpaths, cart paths, horse paths between villages. We use those trails to hike, ride horses, mountain bike, and e-mountain bike. The only things that are prohibited are motorcycles because of the noise. The e-bikes don’t leave any more trace than a horse. But the important thing is respect on the trail. When you see someone coming up the hill hiking or running, you pull over. It’s showing common sense and mutual respect. There isn’t an issue in Europe and France, and it should be similar here. VN: Would you ever go back to racing without an e-bike? XM: No! (laughs) The racing format in Europe is a little bit different — more like an enduro but very long. The descents are timed, and there are parts that have short hills. You just get out there and there are a lot of ups and downs and challenges along the way. I wouldn’t want to do that on a non-e-bike. It’d be too much! 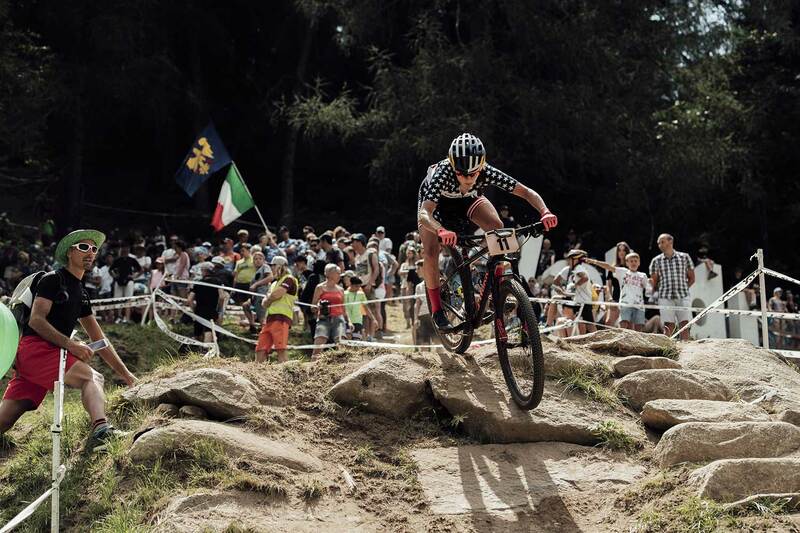 The UCI Mountain Bike World Cup resumed last weekend in Italy with a full slate of events: short-track, downhill, and cross-country. Keeping her impressive season rolling, American Kate Courtney was seventh in the cross-country event, a strong showing after she skipped the Carson City Off-Road due to a knee injury. She surprised even herself with her best World Cup result to date, 1:42 behind winner Maja Wloszczowska. Her Specialized teammate Howard Grotts also had a strong showing in the elite men’s cross-country, finishing 12th in his first World Cup outing of 2018. Scott-SRAM’s Nino Schurter won that race. On the gravity side, North Carolinian Luca Shaw (Santa Cruz) was fourth behind winner Amaury Pierron (Commencal), although he said it wasn’t the run he had been hoping for after qualifying fifth in the rain the previous day. Young Americans also raced well in the under-23 cross-country events, with Christopher Blevins (Specialized) taking fifth and Haley Batten (Clif Bar) placing seventh. In May, reports came out that Breck Epic was going to be sold to Ironman. On Wednesday, the race tweeted that this just wasn’t in the cards for the six-day Colorado mountain bike race. Stay tuned for more Breck Epic coverage — I’ll be riding the event and reporting from Breckenridge, August 5-10. Last night we respectfully declined Ironman's offer to acquire Breck Epic. Their team was incredible across the board; smart, generous & dedicated. Ultimately, their vision didn't align with the community's. In the end, it wasn't about money. It was about legacy.